Well, hello hello. Good news! The extravagantly stupid plans for the Petone to Grenada Link Road, have been ditched. With the road through Transmission Gully currently on route to be the most expensive road in New Zealand’s history, and with P2G due to clock in at – rough estimate – at least 4 times more expensive than Trans Gully – well, at long last someone has had a brain working, and has ordered the project to be stopped. Officially that is because it is to be redesigned – but I think it will be the final, well-deserved nail in the coffin. The monstrously designed road was going to have to cut out about a zillion tonnes of rock out, and the roundabout interchanges at either end were just horrific – I’m glad that it has been ditched. 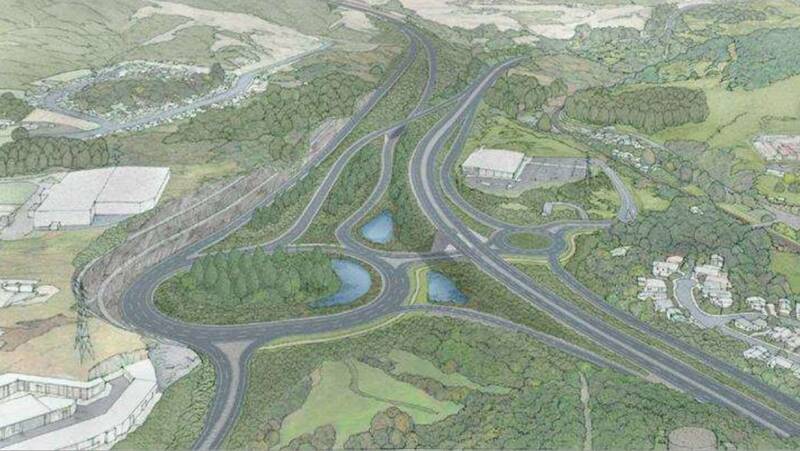 Have you ever seen a worse interchange than this proposed abortion at Tawa? Its back to the drawing board for the next decade NZTA ! Glad theyve ditched a multi billion dollar traffic inducement program but concerned this will delay the petone ngauranga harbour path which was going to use fill from this project. Luke – just to put this in perspective – the present Horokiwi quarry, which has been going for the last 50 years or more, has taken out less rock than this road was going to take out. They were going to take out a COLOSSAL amount of stone – you could probably make a bike path from here to the moon. Its just totally uneconomic and a waste of time and money, and trucks will just have to continue driving north to Haywards or south to Ngauranga, just like they have done for the last hundred years. I wasn’t remotely surprised when NZTA concluded the cost was far in excess of the $250 million originally conceived. There was simply far far too much rock to move to make that possible. One of the key reasons for that was designing it as a 100kph state highway meaning straight lines and massive cuts – up to 90 metres high. I had thought the road was intended to launch up the hill a bit further towards Horokiwi Quarry than shown in your top picture – one of the issues we’d said for some time is that they would need to avoid the Korokoro stream gully. At whatever the now massively more expensive price is that means either down-scaling P2G to a 70-80kph road or putting SH58 back onto the table. We will need to talk with NZTA pretty soon so that we don’t have a decade of uncertainty over any development of the Lincolnshire Farm area. Thanks Andy – yes, I agree, the design of this road as a full-blown highway and the massive amount of rock being excavated are two of the major stumbling blocks for it to work. But also, I really doubt the need for it. 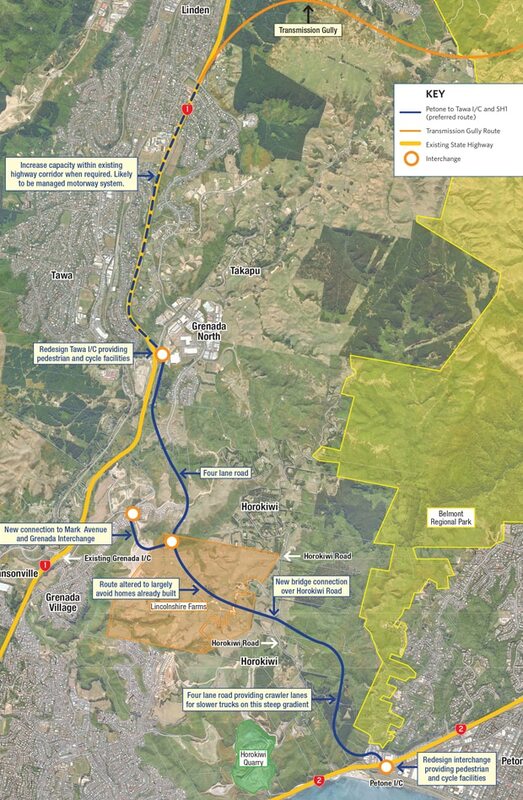 There are already two options to go from P to G – either north to 58 or south to Ngauranga. They’re both already there, at no cost. My thoughts: the guys in the Horokiwi Quarry have been digging rock out for decades. Give them a long term goal – give them another 20 years to dig out a nice inclined ramp through their quarry and up to the cloud lands above. Make a simple flat route through Lincolnshire Farm. 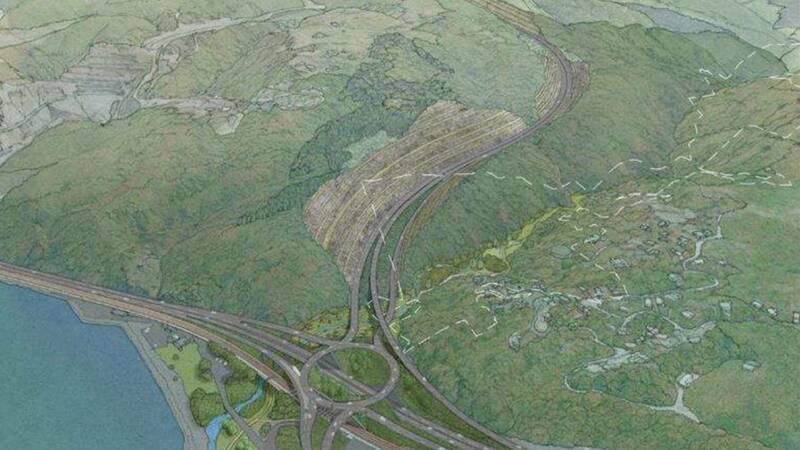 And reducing the Grenada interchange – it is awful enough as it is. Scrap those plans and start again. I am relieved the petone nguaranga reclamation can still go ahead and wasntactually dependant on the spoil from this uber expensive road project. Have you heard where this is at?